Such a cute photo, and the material on the couch is so flattering to a dog or two!! Probably looking at my earthquake link. Lets hope no earthquakes. Very cute photo. Bath? I don’t care if the world is coming to an end; I’m still not getting in a bathtub? Don’t do it! They are just trying to trick you!!! Our Mom doesn’t even like to hear the word earthquake – she worries too much about her son and family out there in sunny CA. Let’s hope you are very wrong. No Dennis say it isn’t so! Earthquakes, hurricanes, elections – disaster, after disaster, after ddddiiiissssaaaassstttter. 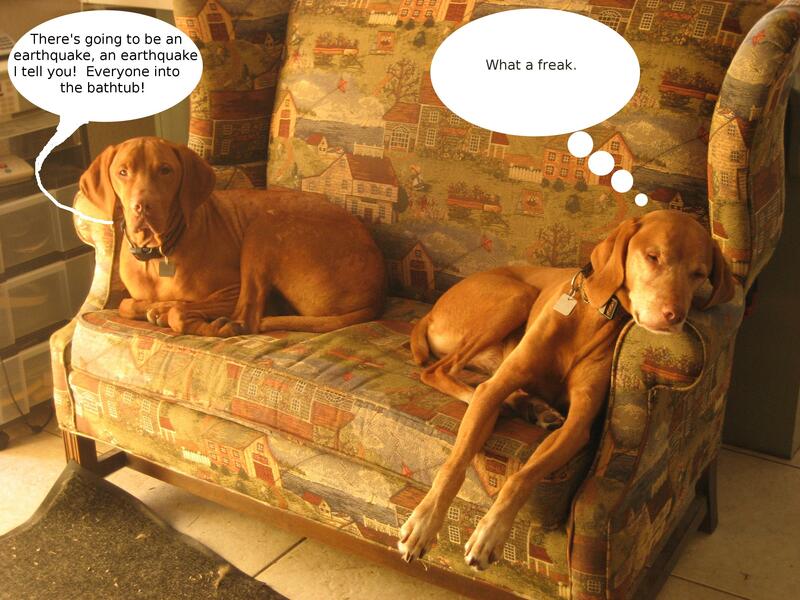 Earthquakes always rouse my dogs out of their naps. Briefly. This could be a greeting card. You should send this to Hallmark. So why are you still on the couch and not in the bathtub?? I think I remember this one about the “prophet in his own country”. Great Pic! Rest up and get better Tucker! No way would our dogs fall for hiding in the bathtub! They’d rather face the earthquake! I remember an earthquake in San Diego in the mid-late eighties. I had a couple of parakeets that started going nuts. About five seconds later, I knew why. If the dogs ain’t freakin’ the ground ain’t shakin’. Don’t bother me man I’m trying to take a nap. Hey pooches, what’s shaking? Oh, nothing at all…. No, no, it is a trick to take to you to the tub to have a bath! Gosh our humans really use dirty tricks, don’t they? How can they threaten such nice creatures as we are? Don’t get too comfy guys, any minute now it could be time to shake, rattle & roll.